I haven’t been writing a whole lot lately. Maybe you didn’t notice but that’s okay. I’ve noticed. I’ve noticed that something’s missing from my days and I’ve put “post in blog” on more than one to-do list. I’ve even half-heartedly searched my brain for something to write about, something that’s making me feel things lately, and I came up pretty empty. For a moment or two I thought about writing about gluttony and how it’s a real thing and how I just want more things and more pop and more candles and more money in my bank account, but other people have already said those kinds of things better than I can. Having nothing that’s making me feel enough things to write a blog post about might sound pretty lame of me, but I’m actually having some pretty good days. They are just days filled with the simple things like books and cooking and movies with my roommate and Just Dance and taking care of my cat and not yelling at my students. Easing into 2014 kind of things. Nothing excitable or emotional, just a lot of simply nice things. So, in search for a topic to write a blog post about (you know, to finally cross that “blog!” off my to-do list) I did what any writer must do and I hit the Facebook. My wonderful, intelligent, diverse group of Facebook friends are always posting interesting articles and sharing thought-provoking blog posts on Facebook. Anytime I check my newsfeed I see plenty of reading material. Sometimes I open up everything that makes an appearance in separate tabs until I’m bored with my newsfeed, then I read them all one after the other. Sometimes I pick and choose, reading only articles that catch my eye. Lately I’ve been ignoring them altogether. Until today when I just had to find something! And I did! I did find something to write about. And it’s about this: QUIT TELLING ME WHAT TO DO, INTERNET! I just feel like all of the articles/blog posts that I have been reading lately have just been telling me what to do. And even though I’m pretty okay with following rules and respecting authority, I have come to discover that I am not okay with strangers on the internet telling me what to do. Like they know me. Like they know what’s best for me or what I need to be more Christ-like. It all feels so distant and finger-pointy and judgey. And I don’t want to be those things. Or feel those things. I think that I grew up believing that being a Christian, being a friend of God if you will, would make life magically wonderful and easy. That’s probably because my life growing up was fairly magically wonderful and easy. My family has had its rough patches, but in my eyes a lot of those rough patches could be blamed on specific family members and their selfish decisions. I could still feel okay because in my me-and-God-bubble everything was fine because I wasn’t a pagan sinner like those people over there. I had Jesus in my heart! It’s all easy breezy from here! Then I learned – really learned and believed deep down in my heart – that this great mess of a world full of babies having babies and 21 year old fathers getting shot down in the street and so many hurtful words is not what God intended. And that helped. It really did. And it made that fifty-eight word prayer six words longer. 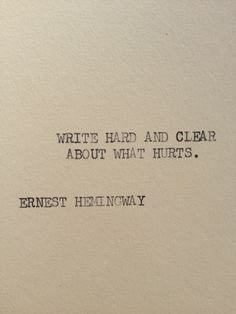 Hemingway can tell me what to do. And for the past three months or so I’ve been praying this kind of prayer. “This is hard! This isn’t what you meant! Help!” And having people tell me that in order to be a (good) Christian I can’t drink or have tattoos or shame my kids on Facebook (seriously, what?) or wear yoga pants or do this or do that or say this or say that or listen to this music or watch that movie or that somehow all of this crap has anything to do with my need for a Savior is just wearing. me. out. I mean, really. Conversations about yoga pants. Is that what we’re down to fellow friends of God? People are dying daily without food or water or the gospel and we’re talking about each other, talking at each other, and blogging about how our ways are best. Let me be the first to tell you, blog readers, my ways are CRAP. My ways are MESSED UP. My ways lead to death. My thoughts on alcohol and yoga pants and child-rearing and pop culture are straight up poop. Filthy rags. I am wholly unqualified to tell anybody what to do unless it’s this – Seek more Jesus. Help me figure out what He did mean, what He did intend, when He created this world and before we screwed it all up. I could also request this – Tell me your story and how you see God, tell me about your life and how you’re making it through because This is hard! and I need help. And I can admit this – This whole entire writing endeavor is just me figuring it all out, an attempt to get just a little bit closer to what God did mean, what He did intend. I need help. I need advice. I need someone steering me in the right direction, pointing me to the cross and getting out of the way, and I bet that you need that too. And so many times I have found that help, advice, direction, and cross on people’s blogs. Which is an amazing and glorious and Hallelujah-inducing thing. Maybe I just need to go hang out at sarahbessey.com/ or eloranicole.com/ where I can find a Christ-like grace and peace and love or at putdowntheurinalcake.com/ where I can find a Christ-like good time. Those are the three ladies that really got me into this blog thing because reading their words makes me feel good even when three word (“This is hard.”) prayers are all I’ve got. So I hope that tattoedmissionary.wordpress.com is never described as distant or finger-pointy or judgey. And I hope that anything I learn I can share with you without assuming that you need to learn that exact same thing in that exact same way and burn all of your yoga pants because I’m learning about personal modesty. At the same time I hope that we never undervalue someone’s story and we always remember that you don’t have to agree with someone on every point to learn from them.